I participated in Odyssey of the Mind as a grade school student, a worldwide competition where children use their creative thinking skills to solve problems and challenges. One year my team had to solve a recycling dilemma. Another year we had to create and present a performance on a specific topic. I can't exactly remember the details, but I do know we pretended to be cavemen that discovered popcorn. My team made it the world finals, a very exciting accomplishment. One of the things I learned from my Odyssey of the Mind experiences is that creativity can be nurtured, even taught. 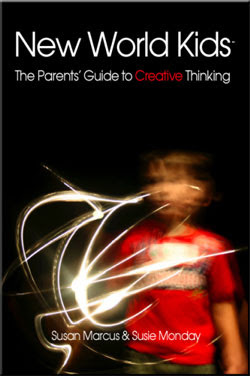 A newly released book titled New World Kids: The Parents' Guide to Creative Thinking encourages parents to reach out to their children and help them exercise their active imaginations. The authors, Susan Marcus and Susie Monday, introduce parents to a new kind of alphabet--a sensory alphabet that consists of nine elements: line, shape, color, texture, sound, space, light, movement and rhythm. The book explores these elements in detail and offers activity suggestions for ways parents can incorporate them into daily life. Parents are also taught how to promote individuality by identifying their children's natural strengths. The book made me stop and think about my daily interactions with my children. What am I doing to help foster their creative thinking skills? Sure, we engage in pretend play, build structures with blocks and those sorts of everyday activities. But do I regularly help build their imagination? Today we made cinnamon rolls. When the rolls are finished cooking I usually let my daughter choose whatever one she wants, but this time around I asked her why she picked out her roll. She briefly thought about the question and responded that she wanted one with just a little bit of cinnamon and she liked the pointy part in the middle of the one she chose. She took in the color, shape and texture of the rolls and used that information to make her decision. The book has been a kind of catalyst for me to enlarge our world. I'll caution that the book at times reads like a textbook, but the large number of color photographs add interest to the ideas presented and help clarify the topics discussed. I especially like all the activities and investigation suggestions. New World Kids takes playfulness to a new level and helps parents encourage their children to look, compare, contrast and collect impressions and observe the world around them. Thanks to Phenix and Phenix Literary Publicists and the authors of New World Kids for the review opportunity. Thanks for your review of our book. We also now have NEW WORLD KIDS AT SCHOOL, a teachers' guide to accompany NWK! We have kid programs coming up in Connecticut this summer too at the Aldrich Museum of Contemporary Art. Thanks again for reading -- and using the book!